Historian Michael Wood discusses how Westerners might better understand China, the world's new superpower, by learning more about its monumental achievements over the past 4,000 years. We'll also get time-tested advice from author Ashley Steel for taking the kids to Europe. 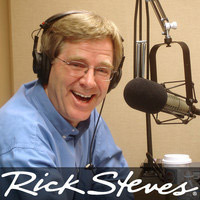 Plus, Rick's son Andy Steves shares his favorite phone apps and other tech tips for travel. Historian Michael Wood, host/producer of "The Story of China"
Andy Steves' guidebook for budget travelers to the major cities of Europe is called "Andy Steves' Europe" and is published by Avalon. The student tour company Andy Steves operates is called WSA Europe. Among the phone apps Andy Steves recommends for travelers are the XE currency converter, and the Google Translate language translation program. The documentary series "The Story of China" is hosted and written by Michael Wood, and has been showing on PBS stations in the United States. PBS features interactive games related to the series on its website. It's also available as a DVD set, or as on-demand streaming, from the "Shop PBS" website. Michael Wood is also known as a popular historian in Britain, who teaches public history at the University of Manchester, and writes occasional opinion pieces on world issues for The Guardian. His production company is MayaVision International. Michael Wood wrote Nine Things You Should Really Learn About the History of China, when the series premiered in 2016 on BBC2. Ashley Steel co-wrote Family on the Loose with her husband Bill Richards. Their website includes blog posts and links to online resources for multicultural experiences abroad or at home, and includes tips for a cross-cultural education in Europe. Lake Bled-based tour guide Tina Hiti's website is called PG-Slovenia. A virtual tour of the Salvador Dali Foundation Theatre-Museum in Figueres, Spain. Caller Scott from Reno is competing in the 2017 Ironman France triathlon in Nice.